Early morning safaris in the forest are one of my favourite life experiences. The meditative silence, punctuated only by constant birdsong and the occasional animal cry; the lush greenery of the Indian jungle and the graceful tango of this ecosystem; the thrill of chasing the big cats, and then finally spotting one in the wild. That morning at Bandhavgarh had been no different. After over three hours in the forest and a great sighting of the tigress Solo, I returned to my cottage at King’s Lodge with a song on a high. I may have had a big smile on my face, but the bumpy ride over rough mud tracks had taken its toll on my back. And what I needed was a massage to remove the kinks and get me going again in the afternoon. My cottage at King’s Lodge was on stilts, with a cosy verandah overlooking the carefully manicured wilderness of the resort. In and around the room, I could see several signs of the fact that the parent company, Pugdundee Safaris, took their commitment to environmental consciousness seriously. 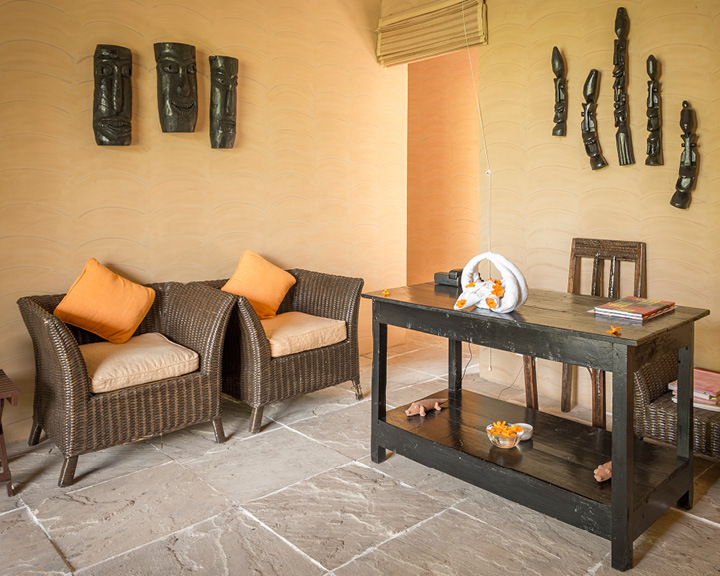 Earth and wood were the predominant materials used across the resort, the walls decorated with colourful Gond paintings, and with no sign of plastic anywhere, including in the bathrooms (think brass bucket and mug). As I made my way over to the spa, the only sounds I could hear were the rustle of bamboo and the rhythmic tok-tok of woodpeckers high up on the trees. 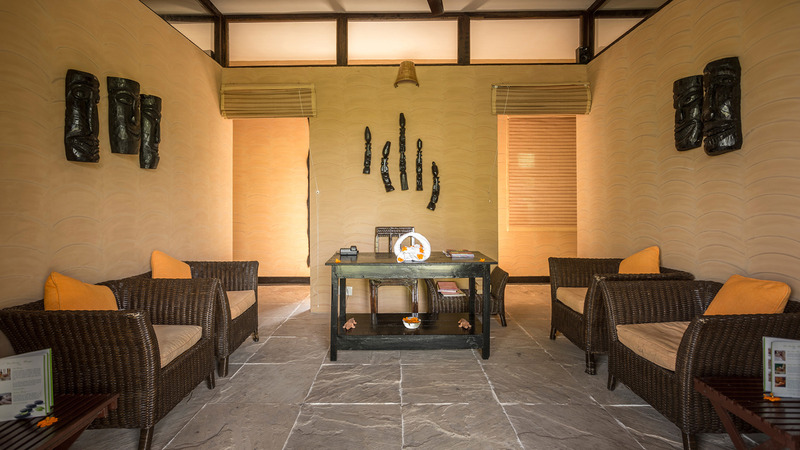 In keeping with the rustic yet classy vibe of the lodge, the decor of the spa was minimalistic. The ochre walls were bare except for a few tribal masks, and the cane furniture accented with bright orange furnishings. 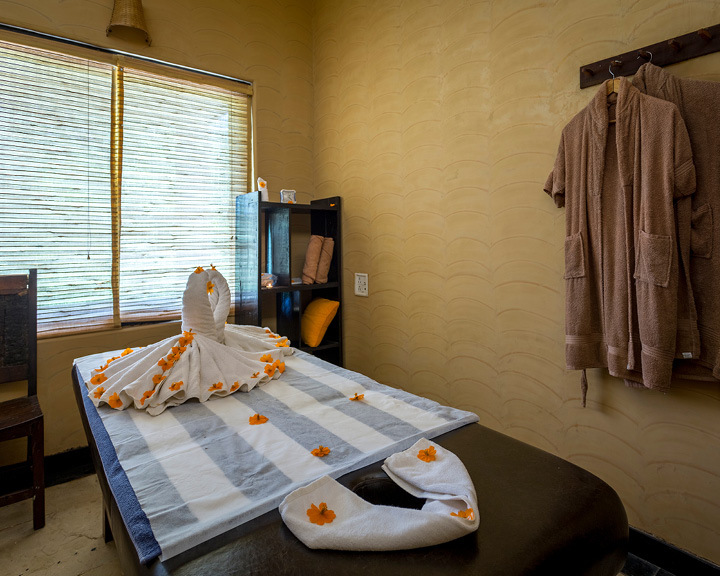 Although I took a cursory look at the spa menu, my mind was already set on a light ‘Abhyanga’, my usual massage of choice. 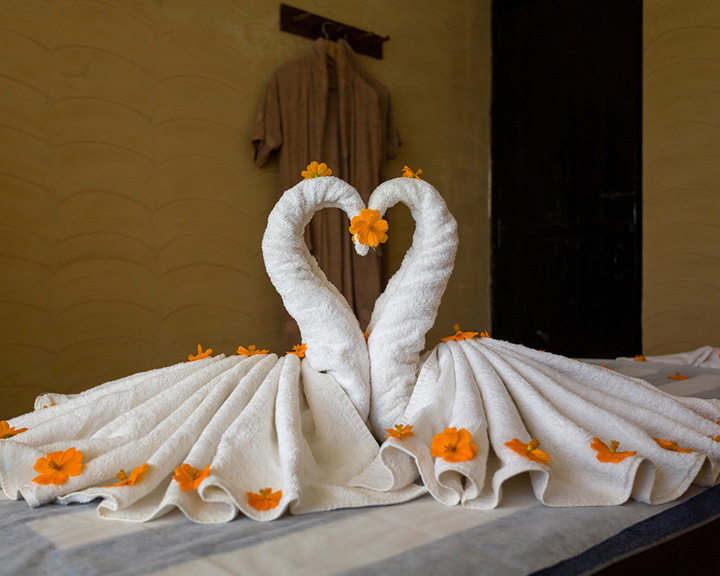 With warm aromatic oil that did not have the typical pungency of other Ayurveda unguents, my masseuse worked her magic on my knotted muscles and aching limbs. 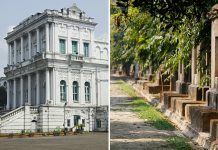 With every stroke of her firm hands, I realised why I liked the ‘Abhyanga’ more than any other kind of massage—the long and flowing technique felt like it was smoothening out all my stress and aches at the same time.